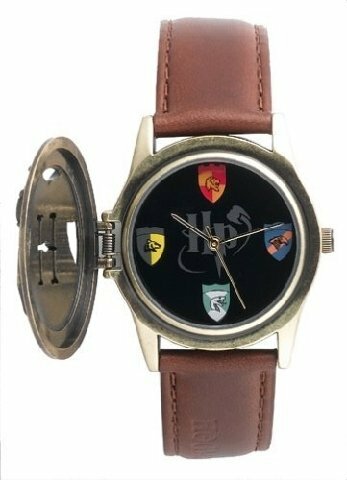 Harry Potter Hogwarts School unisex-adult wrist watch. Handsome bronze embossed and cut-away Hogwarts "H" cover flips back to reveal the inner watch face. Classic black face features "Harry Potter" in the center and the four Hogwarts School house crests at the 12:00, 3:00, 6:00 and 9:00 hour points. Gryffindor, Slytherin, Ravenclaw and Hufflepuff house crests are rendered in full, rich colors. Harry Potter bronze-toned flip-top watch features richly engraved Hogwarts "H" crest on top. Flip open the hinged cover to see the Sorting Hat watch face inside. Buckle clasp on brown leather band has lovely hidden lightning bolt engraving. Classic black face features "Harry Potter" in the center and the four Hogwarts School house crests at the 12:00, 3:00, 6:00 and 9:00 hour points. Licensed Warner Brothers top quality watch made in 2001 only. Rare and discontinued. Will require a fresh battery. Licensed, authentic, genuine, Harry Potter classic design. Collector's item.